Circumstantial evidence suggests this letter to have been written by 32 year-old Samuel Johnson (1835-1907), the orphaned son of John Johnson (1780-1851) and Sarah E. Galloway (1784-1861) of Marshall County, Alabama. He served in Company E, 55th Alabama Infantry. Records indicate that he entered the service as a private and mustered out as a 1st Lieutenant. Samuel wrote the letter to his brother-in-law, Spencer Patterson (1816-1867), who was married to Mary Elizabeth Johnson (1820-1882) in July 1840. The Pattersons’ also resided in Marshall County, Alabama. In the letter, Samuel refers to his good friend, Capt. 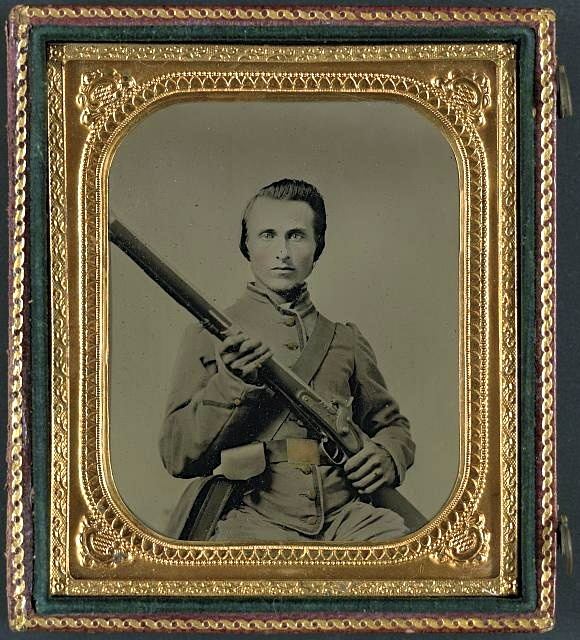 Isaac Henry, who was replaced as captain for medical reasons and send home to Marshall County. It was Capt. Henry who hand-carried this letter to Johnson’s relatives. 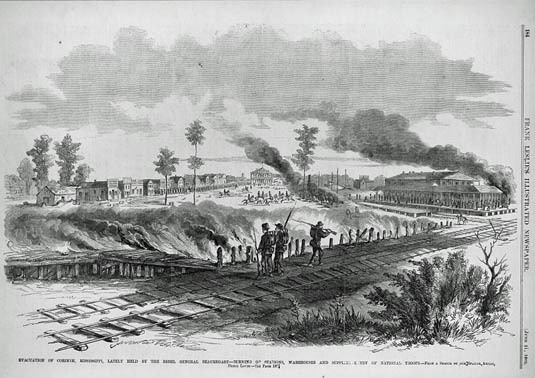 Samuel tells of the evacuation and burning of Corinth, expressing much disappointment in command leadership and the hasty retreat which he likened to the one at Bull Run by the Federal army. I, through the politeness of Capt. Isaac Henry, send you a few lines. Whether they will receive a welcome reception is for you to decide — not me. But one thing is certain and that is one would find me heartily pleased at this time as I am truly anxious to hear from you all at this time. First, as to my health, it is not good nor has it been since I have been in Mississippi. I first had the typhoid fever and after getting over that, I [was] taken [with] the diarrhea which reduced me very much and just as I was getting over that, I [was] taken [with] the yellow jaundice which I still have. And at present am unable to do anything. I also have some affliction of the lungs or breast which renders me unable to march any distance without great fatigue to me. Something now in regard to the war news — and they are not encouraging to the war party of the South. We have just arrived here after three days hard marching and one night. We evacuated Corinth ¹ on last Thursday night [28 May] at nine o’clock. Some remained until friday morning [29 May] and burned the town just as the Federals were coming in town. About ten o’clock on Wednesday, we were ordered out to the rifle pits as though we were going to fight them and the wagons were sent off south with three days rations cooked in them and we taking three days rations in our haversacks. And after staying there Wednesday and Thursday until nine o’clock, we started on a retreat which nothing but a Bull Run can compare. The officers were much worse scared that the privates for they tried to kill us in marching and even beat some of the sick over the back with their swords to make them go on. The was in accordance to the orders of that great and celebrated John C. Breckenridge who once reigned so high in some people’s estimation. But the man who is now so despised by the soldiers whose feelings he now has the authority to trample under his unhallowed feet. This much is intended for John N. Johnson ² whom I deeply respect and would of written to if I had not of been sick nearly all the time and another great reason is I have had no paper to write on nor no money to buy any with. It is worth one dollar per quire and you would have to hunt about two days for it. We marched all night on Thursday night — that is, the company did. I gave out on the way about two hours before and laid down in the corner of the fence and slept until day when I rose and started in pursuit of my company and about eight o’clock next morning I met with the opportunity of getting my breakfast and at the same time found my company which I continued with until late in the evening when I again gave out and stopped, after which I never was able to overtake my company again until they stopped and I do not know whether I would of gotten there at all if I had not of met with the opportunity of riding part of the way on a horse and the balance on a wagon. I have seen enough of the war to satisfy me. Such destruction to life and property I never want to see any more. Corn, wheat, cotton, and everything else was destroyed on the way, gin houses burnt down, the cattle all herded and drove on after the army while the soldiers go in the houses and take the last bit of bread or meat they had while some killing hogs and some killing sheep and everything that could be eaten, vegetables and all that the people had to subsist on. I had intended to have written more but we have just got orders to cook three days rations for some purpose, I know not what is up — whether the run is to be continued or not — or whether they are going to fight. The uncertainty of your getting this letter and my feeling so bad, I will close it as I expect to start shortly to the hospital or somewhere else. I can’t say where to direct your letter but I will write again if I have an opportunity. I expect to send this by Capt. Henry who will also bring one for Mrs. Holland and leave it with you which you will please forward to her. Capt. Henry leaves us all in grief at his departure. He was re-elected by the whole company but rejected by the board appointed on account of bad health and old age. John H. Gibson was appointed in his place against the wishes of the majority who preferred A. B. Carter, had he been there. ¹ By the end of May 1862, a very large Union force occupied a semi-circle around the north and east portions of Corinth. Dug into entrenchments and with heavy artillery ready to blast Corinth’s defenders, Union soldiers under General Henry W. Halleck were confident of victory. The Confederate army, under General P.G.T. Beauregard, knew they could not withstand the Union assault. In an elaborate game of trickery and deception, they retreated rather than surrender (as many Confederate armies did after a siege), leaving the town and its citizens to the enemy on May 30, 1862. Despite an earlier order for all citizens to evacuate, many did not and they came under Union occupation. ² John Newton Johnson from from Marshall County, Alabama. He enlisted in Lewis’ Battalion.